Yucca elephantipes Regel ex Trel. Accepted Scientific Name: Yucca gigantea Lem. Habit at Pukalani, Maui, Hawaii, USA. March 02, 2007. 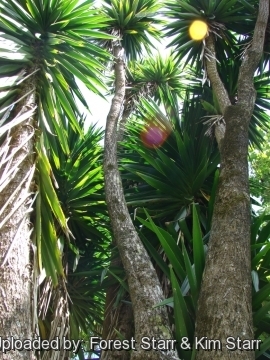 Origin and Habitat: Yucca gigantea (Yucca elephantipes) is native to Belize, Costa Rica, El Salvador, Guatemala, Honduras, Nicaragua and the eastern part of Mexico (Quinana Róo, Yucatán, Campeche, Tabasco, Chiapas, Veracruz, eastern Puebla and southern Tamaulipas). It is also reportedly naturalized in Puerto Rico, the Leeward Islands and Ecuador. 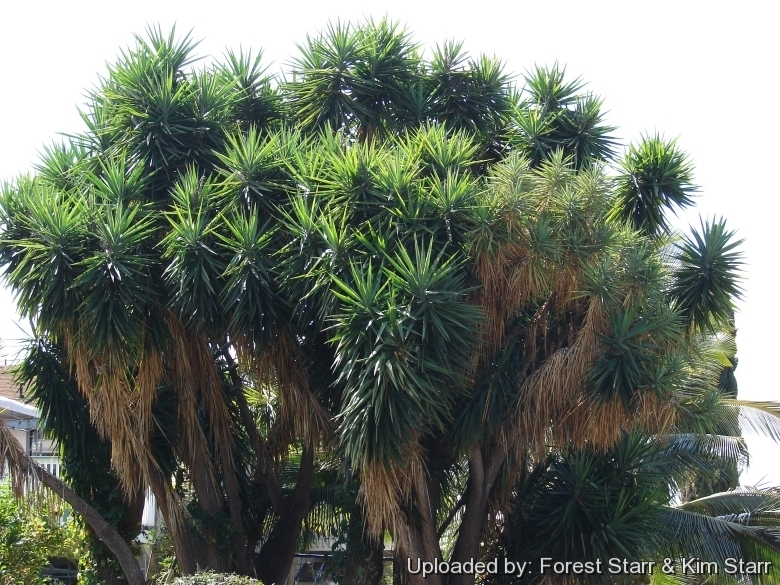 Description: Yucca gigantea (syn: Yucca elephantipes), popularly called "spineless yucca" as well as "elephant yucca", is an evergreen species that may grow into a rather large palm like shrub or small tree with a very noticeable swollen base that tapers up to a slender branched trunk similar to Nolina recurvata. Both trunk and branches produce large, compact clusters of dark green leaves. The leaves are pliable and lack the sharp spines on the tips that are so characteristic of most yuccas, and this is one big yucca, getting up to 9 or more m tall, but usually less than m. This plant has become very popular as a houseplant since the end of the 1970s and its variants are currently being used in most modern interior landscapes. Its worldwide popularity as a houseplant has created a minor industry in Central America. Y. giganteais a member of the agave family and is also closely related to the lilies. 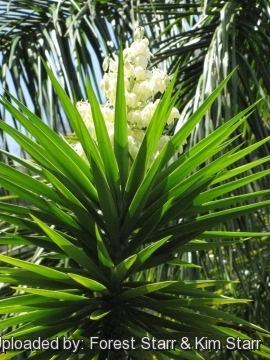 Like other yuccas, this one has white bell shaped flowers borne on tall stalks above the foliage in summer. Stem: With age the trunk becomes rough and thick, and when mature it develops a swollen base and often branches just a few decimetres off the ground. Leaves: In a spiral columnar rosette, linear-lanceolate, strap-like, soft, glossy green, succulent, 60-120 cm long and about 5-7.5 cm wide plane or a little plicate. Margins smooth or rough with obscure teeth and with soft green tip, 5-10 mm long. Sometime a little roughened on the dorsal ridges. The selection, 'Variegata' has leaves with creamy yellow margins. Inflorescence: Paniculate, glabrous, up to 1 metre tall with many creamy white flowers produced within the rosette of leaves. Style short, oblong. Unlike some species, this yucca does not die after flowering. Fruit: Indeihscent, brown, fleshy oval and up to 2.5 cm long. Yuccas require a specific moth for pollination, and if the right moth isn't around, you won't see fruit develop even though the plant produces flowers. Seeds: Nearly circular, 8-10 mm in diameter, not winged. 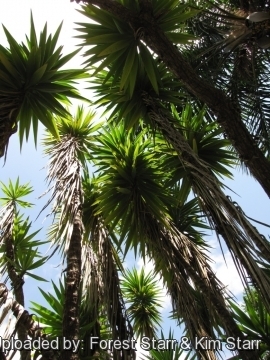 Note: The official name is now Yucca gigantea but the species is most widely known today as Yucca elephantipes. The first mention of that name was by Eduard von Regel in February 1859. He claimed that a different species, Yucca aloifolia, was sometimes known as "Yucca elephantipes" when grown in European gardens because of its thickened stem base. However, since he did not intend to offer Y. elephantipes as the actual correct name, this was not a valid publication. In a major article on yuccas and allies in 1902, William Trelease also used the name Y. elephantipes, referring to Regel's 1859 publication. This came too late though, as Yucca gigantea had by then already been previously established. Charles Lemaire published the name Yucca gigantea in November 1859. This is the name used by the World Checklist of Selected Plant Families as of January 2014, although other sources use Yucca guatemalensis, published by Baker in 1872. 1) Forest & Kim Starr “Yucca elephantipes (Spineless yucca)”. Plants of Hawaii. <http://www.starrenvironmental.com>. Web. 7 Jan. 2015. 3) Wikipedia contributors. "Yucca gigantea." Wikipedia, The Free Encyclopedia. Wikipedia, The Free Encyclopedia, 28 Jun. 2014. Web. 7 Jan. 2015. Cultivation and Propagation: Yucca elephantidens (Y. gigantea) is a carefree and durable plant that provides great colour contrast and foliage interest. Plant in the garden for a unique feature or grow in decorative containers. This is one of the easiest of house plants. The pointed, spineless leaves tolerate the full sun and also stay healthy for a long time with less light. 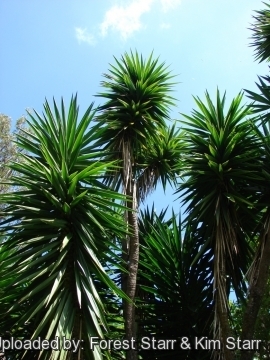 Unlike their larger counterparts, these yuccas have not needle-tipped leaves, so you can plant them near play or walk areas. 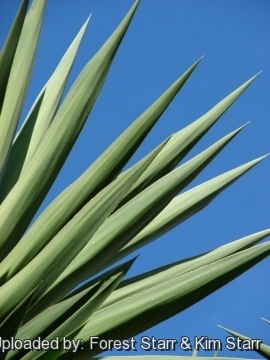 It requires little maintenance, with low water requirements and grows fairly rapidly for a Yucca. During the summer this yucca can be placed outside in its container. In the fresh air it grows noticeably more quickly. Hardiness. Best where winter temperatures stay above 0° C, but resist to5° C in well drained soil, planted in protect and exposed to south area. Plants in containers can be moved inside during longer cold spells. USDA Zones 9 – 11. In frost free climates the spineless yucca will assume treelike proportions. In frostier Zone 8 areas the plants tend to be shrubbier as multiple buds form along a stem when the leaves and growing tip are killed by freezes. Manteinance: Remove dead fronds and spent fruiting stalks for a clean landscape appearance. The dried leaves - and even green ones - can be easily removed from the stem by a strong downward jerk. This is especially advisable if the plants grow near human traffic where the unsuspecting passer-by is sure to be pierced by the sharp-tipped leaves. Use: Spineless yucca is the tallest of the yuccas, and is often used as a framing specimen at the side of a building or along a walkway. It makes a striking presence in large landscapes, but may be too much for a small yard. Since they lack the sharp spines of other yuccas, spineless yuccas are harmless and can be used where most others cannot. They are grown in containers and sometimes seen in indoor malls. Use this handsome tropical looking yucca as an accent in a gravelly succulent garden, but realize it will get large. Soil Stabilisation: Yucca elephantipes is used to stabilize exposed eroding soil banks either alongside roads or around coffee plantations which are kept denudad of all weed growth. Cuttings (2 m.) will be plantel in lines to form living fences. Traditional uses: In Chiapas Yucca elephantipes is frequently planted as a boundary marker at the corners of a man's property holdings. An-other major use is as a marker of major water holes and named points along trails. Finally, the juice of its leaves is used as a medicine for "closed ear": a leaf is first seared over a fire, then it is wrung out, and drops are placed in the ear. Food uses: In Latin America, the flowers of Yucca elephantipes, are served in omelets and soups. Propagation: Offsets. The species is also easy to propagate from stems or truncheons. The stem broke off during a storm. Within weeks it grew these red roots as it lay on the lawn so as you might guess they are very easy to root. Simply plant sections of stem in well drained soil and keep moist.